Gary Steckel and William Ailor of Aerospace Corp., look at a piece of space debris at the firm’s headqquarters in El Segundo (Credits: (Glenn Koenig, Los Angeles Times). The Aerospace Corp.’s Center for Orbital and Reentry Debris Studies (CORDS) estimates reentry times for large space objects predicted to crash on Earth, so their debris can be recovered for analysis. CORDS researchers then analyze the size and shape of the debris and use computer programs to reconstruct its fall to Earth. CORDS is the only center to systematically test space debris in the laboratory, and in the past 37 years they have collected around ten samples of detritus. 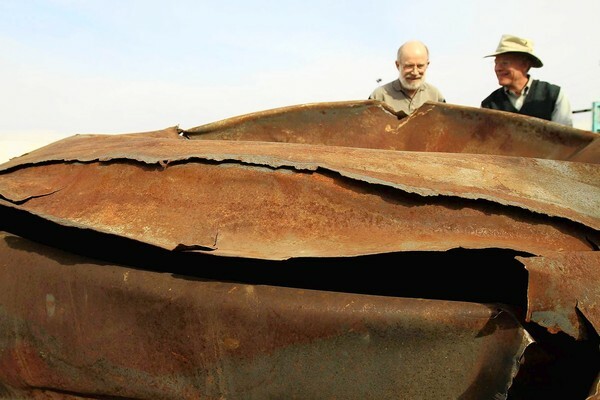 They examine the compositional properties of the recovered metal in order to estimate the reentry temperature and calculate the maximum temperatures reached and why these objects survived. These samples include Delta II rocket components, the remains of which can be viewed outside the visitors’ entrance at Aerospace Corp.’s El Segundo, California headquarters. CORDS has a strong interest in objects that are large enough to not entirely burn up during reentry, but this doesn’t occur frequently enough for comprehensive study. However, just one component like a rusty fuel tank can help the researchers scientists understand what happened to the space object during its plunge. Recently three large spacecrafts crashed on Earth, including the Russian Mars lander Phobos–Grunt. No injuries or damage were reported, but neither were any parts found that could be used for analysis. 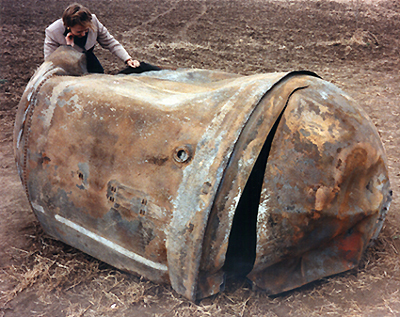 The second-stage propellant tank of a Delta II launch vehicle recovered in Texas in 1997, after orbiting Earth for nine months (Credits: NASA). The CORDS team reconstructs an object’s descent by using radar information and weather records. The object is cut into small bits and then a scanning electron microscope looks for changes in the metal’s makeup that indicate what temperature the debris reached. The environmental conditions during reentry are used to fine-tune the computer models and assess the potential danger from future debris. An interesting finding from this process was that the heating that space junk undergoes at high altitudes is less than expected, therefore materials like titanium and stainless steel can survive reentry with minor damage. This fact has already led to hazard prediction model updates worldwide but it is, Aerospace Corp.’s goal is to implement these results in the spacecraft design process. According to a 2011 NASA report, there are more than 22,000 pieces of space debris larger than 10 cm orbiting the Earth, and probably millions of other items in orbit that are too small to be tracked. An aluminum object of only 2 cm diameter in orbit can cause the same damage as a 200 kg object traveling at 60 mph on Earth due to the high travel velocity of orbiting objects. Defunct satellites can collide in space, generating even more small pieces of hazardous space debris. The generation of new space debris could be mitigated by changing the types and ratios of metals from which the craft are constructed. To help design such modified spacecrafts, Aerospace Corp. is launching mini-reentry vehicles of its own.